Costa Rica is a great place to find exotic tropical fruits. If you like fruit, here are some that you must try on your visit to Costa Rica. 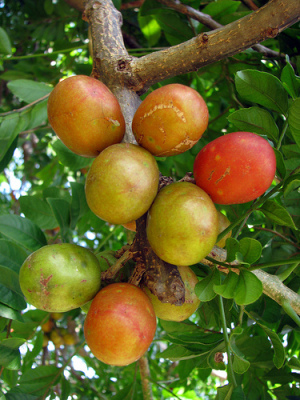 Many of these fruits are native to Costa Rica, but many others were introduced from Africa, Asia, Oceania, Europe, and North and South America. Almost all are regularly found in the stores and farmers’ markets of Costa Rica. Pitaya (Dragon Fruit) Hylocereus undatus,: The seeds are eaten together with the flesh, but they are indigestible unless chewed. The fruit is also converted into juice or wine, or used to flavour other beverages. The flowers can be eaten or steeped as tea. It grows on a cactus plant. Carambola ( Star Fruit) Averrhoa carambola: The fruitis perfect for juice. It has a waxy, golden yellow to green color skin with a complicated flavor combination that includes plums, pineapples, and lemons. Mamoncillo o Mamon. Melicoccus bijugatus. Round fruit that grows in bunches. The green, smooth rind protects a round seed that is wrapped in a yellowish, juicy pulp. 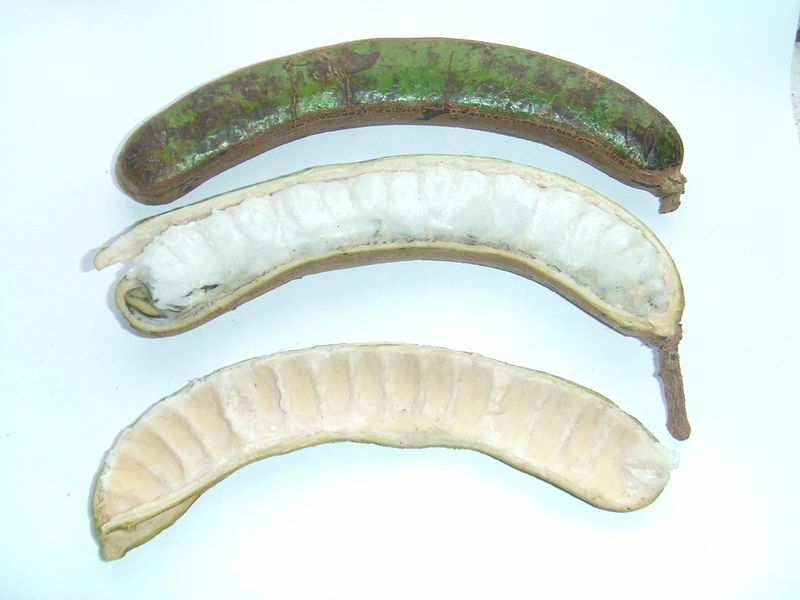 Mamoncillo can be eaten as hand-fruit, simply sucking the pulp out of the rind. Mamon Chino (Rambutan) Nephelium lappaceum : Rambutan in Malay, Indonesian, and Filipino literally means hairy, caused by the ‘hair’ that covers this fruit. It’s very watery and has a huge seed in the center. It tastes pretty decent. Carao (Cassia grandis): It is known worldwide to be an amazing natural anemia treatment. It actually has a slightly sweet taste (due to the natural sugar content) and is quite tasty. In this case smell and taste are not at first reconcilable. 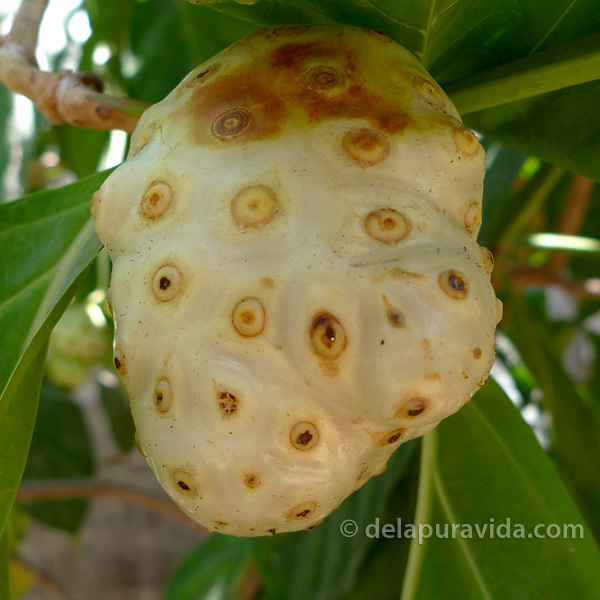 Noni Fruit Morinda citrifolia: The noni plant produces a green fruit that indigenous Cultures in Asia have been drinking for 2000 to 3000 years. Achiote ( Bixa Orellana):It is best known as the source of the natural pigment annatto, produced from the fruit. Crushed annato seeds usually in the form of a paste that is used in Costa Rican foods for coloring. Maracuya(Golden Passion Fruit) Passiflora edulis: The fruit is both eaten and juiced; passion fruit juice is often added to other fruit juices to enhance the aroma. Passion fruit juice is good for people who have high blood pressure. Some research is showing that purple passion fruit peel may help with controlling asthma symptoms. Granadilla(Passion Fruit) Passiflora quadrangularis:It is used for making fruit drinks and often added to other drinks to increase sugar levels and flavors. 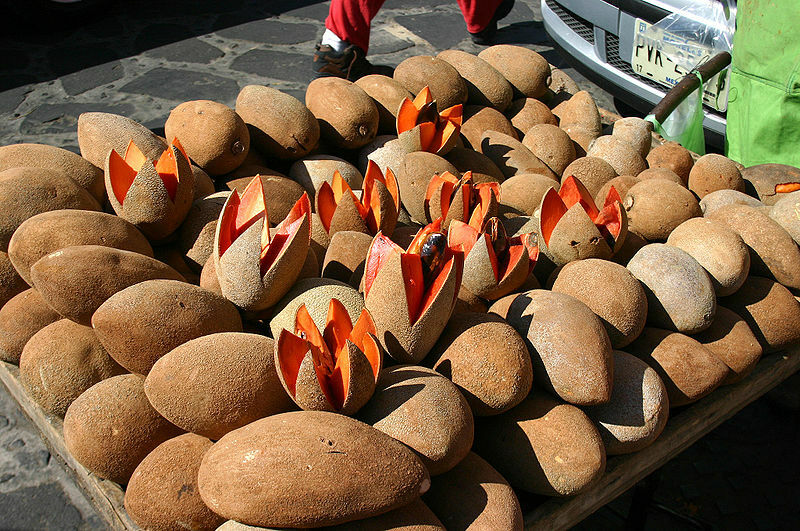 Sapote Pouteria sapota:The mamey zapote looks a lot like a rounded sweet potato when it is sitting on a vendor’s stand. The ripe fruit gives to the touch and the bright pulp has a slightly grainy texture as well as taste that suggests pumpkin. It is a very delicately and tasteful fruit. Often eaten without the peel, it is actually not necessary to remove the rind before enjoying this delicious fruit. Guanabana Annona muricata:It is commonly used to make sweet juices, candy, and ice cream. Many studies show that this fruit is very affective in helping the body to cure cancer. It has been studied that certain properties in the leaves kill cancer cells while leaving other cells in the body unharmed. Manzana de Agua Syzygium malaccense: It has a single marbled sized seed that separates easily from the pulp. The fruit are bell shaped and can be up to eight inches long. The taste can be described as a rose water flavored apple, and they are pleasant and cooling to eat. The trees fruit prolifically, and larger fruit size can be achieved by thinning the crop and watering heavily. Bilimbi Cucumber (Mimbro) Averrhoa bilimbi: It is very Acid fruit. It is eaten either raw or dipped in rock salt. Guaba or Inga :The seeds are covered with sweet white powder. The pulp covering the seeds are lightly fibrous and sweet; rich in minerals and it is edible in raw state. Jocotte. Spondias purpurea. It is a very popular fruit in the summer time. It is a small fruit (2-3 cm in diameter) that can be eaten either when it is still unripe and green, or when the fruit has ripened and has a dark red color. There are two principal species of jocote, both with a large number of different varieties. One of the species is the yellow jocote, harvested during the rainy season mostly from July thru September; and the other is the red jocote, mostly available in the dry season. Marañon . Anacardium occidentale. Cashews are extravagant fruits that have many different uses. 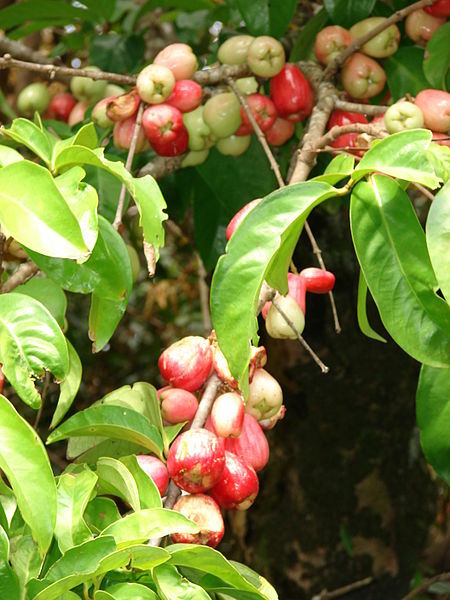 They originate in tropical America, and the cashew fruit has one small but tough external nut. The fruit itself has a smooth exterior, similar to paprika. Scientifically, the small seed is the real fruit and the paprika-like ‘fruit’ is the peduncle.The seed, or nut, is the most valuable part. It is roasted to create a delicious, dry nut with high levels of oil and protein. Fruta de Pan. Artocarpus altilis. Breadfruit is a big, oval-shaped fruit that grows on a large tree. The fruit has a thick rind like pineapple which has to be removed before processing the fruit. The white flesh is seedless. Breadfruit can be served cooked, fried, or baked, and if the fruit is well-prepared it really looks like a slice of bread. Caimito. Chrysophyllum cainito. Star apples are related to sapotes and sapodillas. The fruit is round and the size of a regular orange. Depending on the variety, the rind can be green with white pulp, or it can have a purple rind with pulp of the same color. It can be eaten fresh, or it can be used to produce jellies or marmalades. Soncoya . Annona purpurea. 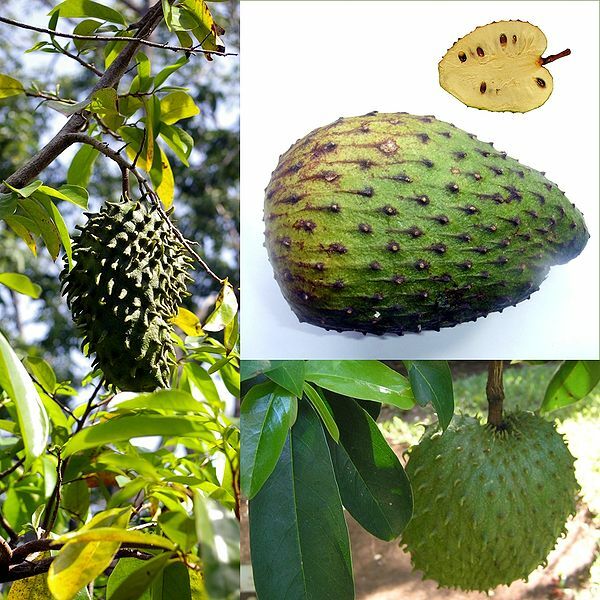 The main thing which differs it from other annonaceous fruits is the spiky hard skin, somewhat resembling a durian, which terminates in short hooks curved towards the stem, and is very aromatic when ripening.The Soncoya has a pleasant peachy/apricot/pawpaw flavour, but is of a quite fibrous texture. I am sure there are more fruits , but for now this is a small list that I will updating in the future. Feel free to add more.